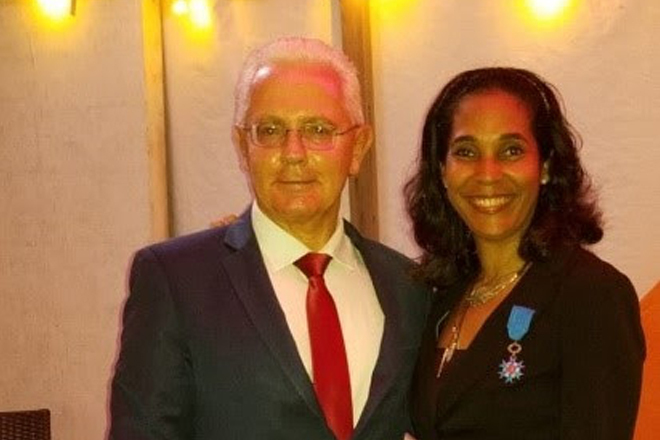 Honorary Consul of France to St. Kitts and Nevis, Ms. Shawna Lake has been bestowed with the order of national merit by the government of France for the sterling and exemplary service she has provided to the government of France since being appointed as Honorary Consul in 2012. According to a media release the Medal of Honour was presented to Ms. Lake in a recent ceremony by His Excellency Mr. Phillipe Ardanaz, Ambassador of France to St. Kitts and Nevis and the other OECS member states, who is resident in St. Lucia. Ambassador Ardanaz had flown in specifically to present the medal from the french government. This occasion was witnessed by close family and friends of Ms. Lake as well as His Excellency Sir S. W. Tapley Seaton, Governor General of St. Kitts and Nevis. The venue was the Spice Mill Restaurant located on Cockleshell Beach. Following the ceremony, the guests were treated to a dinner while being serenaded by Ymelda, a Haitian artiste now living in Martinique.